The combination of alcohol and automobiles is never a good one, except perhaps in the case of this custom beer can car. Originally built for the beer company Stroh, this unique can shaped product mobile is currently on Ebay. If you've always lusted after a Volkswagen powered vehicle shaped like a can, your opportunity has finally arrived. The can seen here is one of the fiberglass can cars produced by Florida based Automotive Innovations in the early 1980s. The company initially designed the cars for Budweiser, but were widely used by Stroh Brewery for promotional purposes. Although these cans were built using Volkswagen mechanicals, they were not kit cars, instead leaving the factory titled as new Pop Top Can Cars complete with a manufacturer's certificate of origin. The can shaped car business was good until 1984 when according to Ron Wharton, who owned Automotive Innovations and designed the car, Mothers Against Drunk Driving decided that vehicles and alcohol should not be mixed, even for promotional purposes. The resulting bad publicity campaign from MADD forced Stroh Breweries to discontinue promotional use of the Pop Top Can Cars. This meant the end of production for the unique product mobiles. If you are interested in more back story of the Pop Top Can Cars, Hemmings ran two articles about them a few years ago that can be found here and here. According to the owner, this former Stroh product mobile drives beautifully and is currently registered. If that wasn't enough, there is space on board for a 15 gallon keg with everything needed to run it. 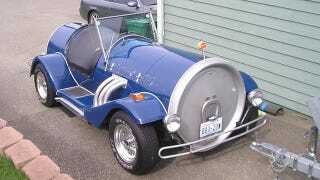 The Pop Top Can Car is currently listed with a buy-it-now price of $7500 dollars if you. Whether you are a business owner in need of a promotional or just an enthusiast of all things Beer, this is a rare chance to try and figure out what to do with an original Pop Top Can Car.